The Sacred Page: TIME Magazine: "'Liberal' Catholicism Dead"
TIME Magazine: "'Liberal' Catholicism Dead"
"Are you a liberal or a conservative Catholic?" I absolutely hate that question. What it tries to do is politicize the Church. And when people ask me that question I tell them exactly that and then say, "I'm just Catholic." I believe what the Catholic Church teaches. Of course, that's not good enough for some people, who then conclude: "Oh, so you're a conservative." Well, let me tell you, I like the Mass said in English--I love it that Vatican II did that. I also love that the Council expanded reformed the Liturgy of the Word and lectionary cycle--it's way better than what we had before (far less Scripture was read!). Indeed, I could go on and on about things I love about Vatican II. Even more, I have nothing bad to say about Vatican II! Here's the way it is: I'm not Catholic simply because I was born Catholic. While I was raised a Catholic, I continue to be Catholic because I choose to be. At the same time, I am not Catholic because I suppose that I am the best arbiter of truth and because, in my great wisdom, I have decided that the Catholic Church comes closest to what I think is right. I don't that's the kind of system Christ established. I think he left his teaching authority with the apostles, especially Peter, and I think we have to submit ourselves to that authority, which they expected would belong to their successors. This was clearly what Paul, and early figures like Clement and Ignatius thought! I want to agree with the Church, not convince the Church that it needs to agree with me. Nonetheless, I still get asked: "Are you a liberal or conservative Catholic?" And I just keep responding: "I'm just Catholic." Of course, there are Catholics who identify themselves as conservative or liberal. Some will say that "Catholic" isn't good enough for them. They've decided the Church doesn't fit well with their own theology. They want something different: "let's repeal Vatican II, it did too much" ("conservatives") or "let's have a Vatican III, it didn't change enough". While most of those who really believe Vatican II was evil have simply stepped out of the Church and into sects like the Society of Pius X, those who think the Church needs to change its teachings on things like abortion have not. A clear example of such a person is Rudy Guiliani, who has actively protested the Church's teaching on abortion while insisting that he's still a Catholic. In fact, those my age vividly recall those from older generations--especially those who grew up in the sixties--teaching us things slogans like, "We are Church," a phrase understood as a rallying cry against the teachings of Church. I specifically recall having a Confirmation teacher who liked to take issue with this or that belief, explaining that, for example, things like "hell" were not really something we needed to accept as Catholics. "Hmmm," I remember thinking, "If he doesn't believe what Catholics believe, why would he still want to be Catholic? Why not join a church he thinks is correct." Of course, such Catholics as my confirmation teacher would quickly identify themselves as "progressive" or "liberal" Catholics. Well, all I have to say is that not too many people from my generation have got "hip" to their ideas. We recognize that many of them have devoted their lives to serving the Church--many of them were our religious education teachers--and we love them. But those such movements are clearly fading. I know it. Others my age know it. It's just a fact. In fact, this is just a demographic fact. Let's face it, those who want to change the Church's teaching on birth control and abortion are just not reproducing themselves as fast as those who accept it. And, frankly, looking at the "progress" they've made in the last forty years doesn't really inspire hope in younger people that the "cause" to change the Church in such ways is really going to take off. The liberal rebellion in American Catholicism has dogged Benedict and his predecessors since the Second Vatican Council of 1962-65. "Vatican II," which overhauled much of Catholic teaching and ritual, had a revolutionary impact on the Church as a whole. It enabled people to hear the Mass in their own languages; embraced the principle of religious freedom; rejected anti-semitism; and permitted Catholic scholars to grapple with modernity. But Vatican II meant even more to a generation of devout but restless young people in the U.S. rather than a course correction, Terrence Tilley, now head of the Fordham University's theology department, wrote recently, his generation perceived "an interruption of history, a divine typhoon that left only the keel and structure of the church unchanged." They discerned in the Council a call to greater church democracy, and an assertion of individual conscience that could stand up to the authority of even the Pope. So, they battled the Vatican's birth-control ban, its rejection of female priests and insistence on celibacy, and its authoritarianism. Rome pushed back, and the ensuing struggle defined a movement, whose icons included peace activist Fr. Daniel Berrigan, feminist Sister Joan Chittister, and sociologist/author Fr. Andrew Greeley. Its perspectives were covered in The National Catholic Reporter, Commonweal and America. Martin Sheen held down Hollywood, and the movement even boasted its own cheesy singing act: the St. Louis Jesuits. The reformers' premier membership organization was Call to Action, but their influence was felt at the highest reaches of the American Church, as sympathetic American bishops passed left-leaning statements on nuclear weapons and economic justice. Remarks Tilley, "For a couple of generations, progressivism was an [important] way to be Catholic." Then he adds, "But I think the end of an era is here." But the familiar progressives-versus-Vatican paradigm seems almost certain to be undone by a looming demographic tsunami. Almost everyone agrees that the "millennial generation," born in 1980 or later, while sharing liberal views on many issues, has no desire to mount the barricades. Notes Reese, "Younger Catholics don't argue with the bishops; they simply do what they want or shop for another church." And Hispanic Catholics, who may be the U.S. majority by 2020, don't see this as their battle. "I'm sure they're happy that the celebration of the Eucharist is in the vernacular," says Tilley, "but they don't have significant issues connected to Vatican II." You can read the whole thing here. It is odd to me that the article somehow implies that sexual abuse scandal was good for "progressive" Catholics. The abuse clearly happened in all places, not simply in "conservative" or "liberal" strongholds. Thanks for the great comment, Michael. Look forward to hear you speak at the family conference this summer at L.A. Hope all is well at San Diego. I'll take another exception to the article. 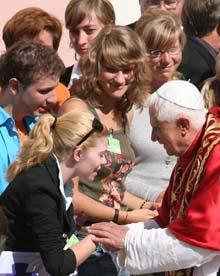 Benedict himself has said that VII was not supposed to be a rupture. Outward signs did change, but I don't know what else did except people's attitudes. I do know that the generation of scholars that is just finishing (y'all here in the blogosphere, myself, others that went to school with me) is very faithful to the tradition. Some, like me, have to re-learn what the tradition has been teaching at times. I think he left his teaching authority with the apostles, especially Peter, ... This was clearly what Paul ... thought! You mean this is clear from passages like Galatians 2:11-14 where Paul opposed Peter's wrong teaching? Let's face it, those who want to change the Church's teaching on birth control and abortion are just not reproducing themselves as fast as those who accept it. So Catholic truth is dependent not just on majority vote but on differential demographic trends? To me, truth depends neither on majority vote nor on the word of any individual, except of Christ himself. Thanks for clarifying to me why, although I admire the present pope in many ways, I am not a Catholic. I totally agree--truth depends upon Christ. I wouldn't listen to the teaching of the Church for any other reason than I believe it is preserved by the grace of Christ. Nor would I ever claim that the Church's teaching is based on demographics. If you got that from what I wrote, I wasn't clear enough. My point was about a certain group of very vocal people who are clearly fading away. But it also seems pretty clear to me that Jesus gives his authority to teach in His name to certain individuals and others are bound to listen to them (e.g., Luke 10:16: "He who hears you hears me, and he who rejects you rejects me, and he who rejects me rejects him who sent me"). As for Galatians... I've studied Theology at Fuller and Azusa Pacific University and I know how this passage is often used to drive a theological wedge between Peter and Paul. In short, I don't think there's been a passage more misrepresented. I encourage you to read Markus Bockmuehl, Seeing the Word: Refocusing New Testament Study (STI; Grand Rapids: Baker Academic, 2006), 121-136. Bockmuehl, of course, is not a Catholic, but he explains how people have read far too much into the episode in Galatians. In sum, I'll say this: there's no doubt that Peter was in the wrong. But nowhere in the passage is he condemned for his wrong teaching. Clearly, Peter knew that distancing himself from the Gentiles was wrong. He did it not because his theology was wrong, but because he feared controversy--he was acting cowardly. But to turn this episode into a theological debate between Peter and Paul is to read into the text. "Then after fourteen years I went up again to Jerusalem with Barnabas, taking Titus along with me. ﻿2﻿ I went up by revelation; and I laid before them (but privately before those who were of repute) the gospel which I preach among the Gentiles, lest somehow I should be running or had run in vain". Earlier Paul even talks about spending fifteen days with Peter in a way that clearly underscores his importance: "Then after three years I went up to Jerusalem to visit Cephas, and remained with him fifteen days. ﻿19﻿ But I saw none of the other apostles except James the Lord’s brother" (Gal 1:18-19). Obviously, Paul condemned Peter for what he did. But when it came to what should be taught, I don't think there was much of a debate. So I don't believe (nor should any Catholic) that Peter or his successors are necessarily always going to be holy people--indeed, wicked popes have existed in abundance! But their official teaching (not private opinions) are, I believe, perserved by the Spirit. By the way, something similar seems to be stated by Jesus about those with teaching authority in the Old Testament: “The scribes and the Pharisees sit on Moses’ seat; ﻿3﻿ so practice and observe whatever they tell you , but not what they do; for they preach, but do not practice" (Matt 23:1-3). So I think this notion of teaching authority and succession in teaching authority fits in pretty well with first-century Judaism. In fact, taking Jesus' Jewish background seriously, it seems pretty difficult to imagine Him establishing a Church any other way. In fact, Clement, Ignatius, Irenaeus, etc., show us that this is exactly how the early Christians believed Jesus had established things. Perhaps we both have plausible interpretations of the model for ecclesiology found in Jesus' teachings and the New Testament. At the end of the day, however, we do know how, for example, Clement--lived in the apostolic era--understood the intentions of Jesus and the way the apostles taught in his name. Thanks for your comment. I realize we are likely to disagree here, but I always enjoy thoughtful conversation. I hate that conservative/liberal Catholic identification, too. I'm another "just Catholic"...also by choice, after ditching it a while, then assiduously reading the NT and then going out taste-testing some other churches and realizing the treasure I had with the direct vertical worship of God and the deep understanding of the Scriptures and what they actually teach and mean.